How To Read Credit Card Bills? * A snapshot of your credit card number (a 16-digit number that can begin with '4' or '5'), the statement date, the date on which your payment is due, the total amount due and the minimum amount due. * Your account summary. This contains detailed information about the purchases you made before your bill was prepared; that is, the statement date. * You will also find various other items like your balance payment you have to make from the previous month, the payment you made on your last bill, interest charges applied on the payment you owe your credit card provider (if any), late payment charges (if any), service tax and cash advances (if any). * The bill also contains your credit summary. This summary mentions details such as your total credit limit, available credit limit, cash limit and available cash limit on your account. Available cash limit = Total cash limit - Cash amount withdrawn. For instance, if your total cash limit is Rs 4,000 and you withdraw Rs 2,000 on it, your available cash limit will be Rs 2,000. 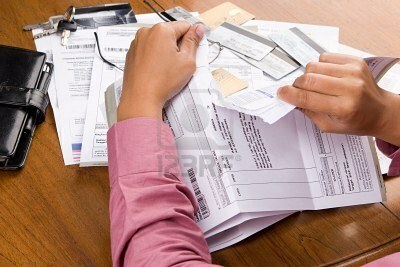 Let us now look at each of these terms so that you can navigate easily through your next credit card bill statement. This is the date on which your card issuer prepares your bill. A statement of your purchases during one billing cycle is created and mailed to you on the same day. The billing cycle is the period between two statement dates; normally, a billing cycle has 30 days. On the billing date, all the purchases you made using your credit card during the previous 30 days are added and billed to you. This information, however, is not printed on the bill statement. Let's say, you made purchases worth Rs 7,000 in the last 30 days. Your bill will list the occasions on which you used your card and where you used it. It will not list what you purchased. For example, it may say Crosswords -- Rs 500, but it won't say if you spent that money buying books or music or both. Now, let's also say your total bill the previous month was Rs 5,000. Since you were running a little short of cash, you paid only Rs 2,000. This will reflect as 'Payment made' in your credit card bill. Hence, your bill this month will be Rs 10,000 (Rs 7,000 + Rs 3,000) plus interest charges on this amount. Since you have brought forward the amount of Rs 7,000 (this is known as revolving credit), interest will also be charged on fresh purchases. In addition, you will also be charged a late payment fee for not clearing the previous month's bill before the due date. However, no interest is charged on fresh purchases if you have clear your bills on time. If your billing date is March 28, then your statement date will be March 29. This is the day on or before which your payment should reach your bank or credit card issuer. Otherwise, they levy late payment fees of Rs 300 or 30 per cent of minimum amount due, whichever is more. This means you will have to pay a minimum late payment charge of Rs 300 if you miss your payment due date. Let's say you made purchases worth Rs 10,000 in the month of January on your credit card and paid only Rs 8,000 before the due date. In this case, the balance amount of Rs 2,000 will be added to your next month's statement. If you made fresh purchases worth Rs 2,000 in February, then your bill statement for this period will have the total due of Rs 4,000 plus the interest charged on your previous outstanding amount (Rs 2,000) and on fresh purchases (Rs 2,000). This is the minimum amount you must pay after receiving your statement every time. Usually, this amount is three to five per cent of your total amount due. A smaller part of this amount goes towards repaying the principal amount and the bigger part goes towards financing interest charged on it. Let's say, for instance, that your total amount due is Rs 10,000 and your minimum amount due is Rs 1,000. If you make a payment of Rs 1,000, then Rs 800 will go towards interest charges and the remaining Rs 200 will go towards reducing the total amount due (It's like the EMI on your loan, where your EMI partly pays your interest and partly pays off your principal amount). Do remember, however, that this split between the interest amount and the principal amount differ from bank to bank. In the next month's statement, the total amount due will be Rs 10,000 less Rs 200 (the amount that went towards payment of principal), that is Rs 9,800. This, of course, is assuming you have not used your credit card to buy anything in the interim. However, if you make purchases worth Rs 2,000 before the next billing date, then interest will be charged on Rs 9800 plus Rs 2000, that is Rs 11,800. This is the amount you have not paid on your previous bill; as a result, it is carried forward to the next month's bill. Assume the total amount you have to pay in the month of January is Rs 5,000. But you have paid only Rs 3,000. The next bill that you will receive in February will reflect the unpaid amount of Rs 2,000 (the total you owe your credit card company minus the payment made). Now that you know about billing cycles and billing dates, payment due date, minimum amount due, total amount due and previous balance, let us look at what else you will find on your credit card statement. Once you understand them, you will be able to spend and use your credit card judiciously. This will list the purchases made by you on your card during one billing cycle. It comes with the date on which the purchase was made. This enables the cardholder to verify the purchases s/he made if s/he keeps the bill with her/ him. This is the penalty you will have to pay if you don't pay your bill by the due date. If your due date is June 20, 2012, and if the payment does not reach your credit card issuer before this date, then a late payment fee of 30 per cent of your minimum amount due is levied on your card. However, this is a general figure; different card issuers charge different late payment fees. This is what the card issuer charges you for using their credit card and not making the payment on time. Interest is charged only if you fail to make total payment on your account before the due date or pay only part of the amount due. For example, if your bill shows you have made purchases worth Rs 4,000, but you find that you can pay Rs 2000, then interest will be charged on the balance Rs 2000. Until you clear all your outstanding dues, any purchase you make using your credit card will be added to your loan amount and you will be charged interest on it. This is a monthly interest charge of three per cent on your balance outstanding. This works out to 36 per cent per year, making the credit card one of the costliest modes of borrowing money. This is the tax the company levies for offering you their services; it goes to the government. Every card issuer allows a cash withdrawal facility on credit cards. This is generally a fixed percentage of your total credit limit. This facility allows you to use your credit card just like your bank's ATM. However, once your cash advance limit is fixed, you can withdraw only upto that amount. If your cash advance limit is Rs 5000 then you can't withdraw an amount more than this. One important thing to note is cash withdrawn using this facility does not enjoy a credit-free period. That is, interest is charged on this amount from the day of withdrawal. For example, if you withdraw cash of Rs 5,000 on March 12 and your billing date is March 30 then interest will be charged for 18 days. Let us assume that your card issuer charges you an interest of 2.5 per cent on this facility. In that case, the interest charged will be Rs 75 (Rs 5,000 x 2.5 per cent x 18/30). This is the maximum amount for which you can make purchases on your credit card. If you have a credit limit of Rs 10,000 (including the cash advance limit) per billing cycle, then you cannot use your card to buy goods more than this amount. If at all you try doing it, the transaction is not validated. When the merchant swipes your credit card, it sends the data stored in the magnetic tape of your credit card to the credit financers (Visa or Master) servers to check for your credit limit. Your card issuer enhances the credit limit if you make regular payments on your card account. However, this is discretionary and differs from one card issuer to another. This is the credit amount you can avail of after making purchases. Let us assume your credit limit is Rs 10,000. On March 31 you made a purchase of Rs 4000. On that day your total credit limit will decrease by Rs 4000. This means that, as on March 31, your credit limit drops to Rs 6000. Now on April 1 if you were to buy a purchase worth Rs 7000, your transaction will not go through. This is because your available credit limit is now Rs 6000. Remember that at no point in time will you be able to buy good/s more than your total or available credit limit. This is how the credit card company maintains a check on the amount you can spend using a credit card. However, if you make a payment of Rs 3000 on the total due amount of Rs 4000 on your March bill, then this payment made gets added to the available credit limit for the month of April. This amount will reflect in your April bill as 'payment made'. Available credit limit in Current Month = (Total credit limit - Total amount due in Last Month) + Payments made in Last Month. In the above case, available credit limit in Current Month will be equal to (Rs 10,000 - Rs 4000) + Rs 3000, which is equal to Rs 9000. In case if you are curious and want to know who finances your credit card spending every month, look at the first digit of your 16-digit credit card account number. A card account number beginning with '4' is a Visa card and the one beginning with '5' is a Master card. Remember, your card issuer and card financer are two different entities. For example, if you have a bank account with ICICI Bank and it issues a credit card to you, then the bank is the card issuer. If this credit card begins with the digit '4' then Visa finances your monthly purchases; if it begins with '5' then Master Card is the financer.